How something unrelated to your business can be a great way to build strong customer relationships. Dan’s fateful trip to a Manhattan electronics store with a “creative” pricing system. Why customer experience is key to word-of-mouth marketing. More Is More: How the Best Companies Go Farther and Work Harder to Create Knock-Your-Socks-Off Customer Experiences by Blake Morgan (host of the Modern Customer Podcast) is our book this week. Morgan argues that customer experience is not synonymous with customer service, and points to how you can DO MORE: Design something special; Offer a strong employee experience; Modernize with technology; Obsess over the customer; Reward responsibility and accountability; and Embrace disruption and innovation. Effort is one of the most important aspects of customer experience. If the process is going to be difficult or confusing, it should be difficult for the company, not for the customer. Happy employees are more likely to make the customer happy. Today’s This Just Happened comes to us via the Speak Pipe, which you can use too. Denise Treco, Director of Communications and Marketing at the Jacob Burns Film Center in Pleasantville, New York. She shares with us how they turned their internal cooking competitions (a fun employee experience) into a staff cookbook they could share to bring their customer relationships to a new level. The cookbook is an example of how you can have a big customer experience impact for low or no cost. Moments of surprise and delight don’t have to be directly related to what you do. This is not a typo—this week we have TWO This Just Happened segments. Dan was attending a customer service conference in New York City when he realized that he had forgotten his microphone. When he went into an electronics store near Times Square, he ran into a few (unpleasant) surprises that can teach us some valuable lessons about the customer experience. Ripping off your customers is not a sustainable business model. As a customer, a “no refunds policy” immediately raises a red flag. If you treat your customers with respect, they will respect you back. 80% of customers rely on word of mouth from peers to decide where to shop. If you think about it, when we need something new we invariably ask our friends, but so few companies take this into consideration. A remarkable experience is the best way to ensure word-of-mouth marketing for your business. We used sound effects in this episode from Freesound.org. Dan: Join us as we discuss doing more for your customers, a simple and free idea to build relationships with your customers and how not to treat your customers. Joey: Doing more, engaging more, and charging more. Oh my. We're excited to give you an overview of an important book you should know about, as well as share some of our favorite passages as part of our next book report. Dan: Today, we're talking about a book called 'More Is More: How the Best Companies Go Farther and Work Harder to Create Knock-Your-Socks-Off Customer Experiences'. The author is Blake Morgan, who I had the pleasure of meeting and hearing speak at Social Media Marketing World, and she described herself as a customer experience futurist. She's the host of The Modern Customer Podcast and a weekly customer experience video series on YouTube. Let's hear from Blake in her own words about what 'More Is More' is about. Blake Morgan: Blake Morgan here, author of the book, 'More Is More: How the Best Companies Go Farther and Work Harder to Create Knock-Your-Socks-Off Customer Experiences'. I am excited to be featured on The Experience This! Podcast. Thank you, Dan and Joey for having me. My book is essentially a book that talks about how companies need to focus on making customers' lives easier and better. It's really an attitude. It's in the culture of the company. Do we make life harder on ourselves to make it easier on our own customers? Something interesting about this book that I realized after it came out was there is a common misconception that customer experience happens in the contact center. That is definitely not true, and I realized this because I would be interviewed on AM radio stations that no one has ever heard of for the publicity for my book, and the radio DJ would say, "Hey, Blake. So cool. Love the book. It's all about customer service." Clearly, they didn't read the book and they don't understand that customer experience is not synonymous with customer service. Customer experience is shaped by so much more than what happens after the credit card is swiped. It has to do with your technology, the people you hire, your company culture, do you embrace innovation, do you embrace accountability and responsibility, and so much more. Today, we're starting to have more awareness at the sea level about what customer experience actually is, and that makes it more fun for me to write and talk about these issues. I'm excited to share a passage with you from my book that illustrates how customer experience is truly an attitude. It's in the culture. Some companies get it. A lot really don't get it, and let's toast right now to customer experience. Thank you, Dan and Joey. Dan: Joey, I really liked this book. It was very straightforward and it clearly articulated both where we are in terms of customer experience today and where companies are going to need to be tomorrow in order to survive and thrive, and I think Blake has a really good sense for how to do right by the customer, how to wear the customer hat in the meetings that you're in and think like a customer, understanding their needs, and then also, she really focuses on leveraging technology and people, the human resources to deliver memorable experiences to customers. Joey: I agree. I think there are so many folks out there in the customer experience and the customer service space in general that talk about all these detailed, kind of highfalutin concepts, and what I love about Blake's book is she focuses on things that one might look at and say, "Oh, those are kind of basic", but the reality is, most companies don't get the basics right, and so I love that she's like, "Look. Here are the foundational things you need to do." She introduces this acronym, D.O.M.O.R.E.. These are the steps that Blake recommends that companies take to emphasize customer relationships as being the key to the great customer experience you could create. The acronym, D.O.M.O.R.E. stands for D, design something special, O, offer a strong employee experience, M, modernize with technology, O, obsess over the customer, R, reward responsibility and accountability, and E, embrace disruption and innovation. I think it was just that again, these are things that every company should be doing and many are just failing to do. Dan: Yeah. I mean, starting with design something special, we talked about in the last episode that you have to have a great product or service to start. If you don't have that, then nothing else really matters, and we've also talked in the past about emphasizing the employee experience. When you have happy employees, that shows to a customer, and you tend to then have happy customers. I think that again, Blake just focuses a lot on technology and she talks about Chatbots, and social media, and different ways of engaging with customers, and in almost every industry, you need to be forward-thinking and follow this technology, otherwise, you're going to be left behind. Obviously, we always believe in obsessing over the customer, and I love that word 'Obsess' because it doesn't mean just focus on or think about. It really means lose sleep over. Think about nothing else. I agree with you that I think her principles are important for every company to follow, and again, I thought she did a really nice job of laying them out in an easy to understand way. Joey: I agree. I think it was also, I liked when she was talking about offering a strong employee experience. She tells a story about how the founders at Airbnb actually brought their appreciation for design aesthetic into the design of the headquarters, and so, there are so many different things that you can do from a conscious experience design point of view, both externally facing towards your customers and internally facing towards your employees, and I really like that Blake gives a lot of different types of examples in her book. Dan: Now, let's hear from Blake again as she reads her favorite passage from the book. Blake Morgan: Let's talk about time. Most of us feel like we don't have a lot of time. We work more than 9:00 to 5:00. Then, we add two hours a day for commuting. The average person gets up between 6:00 and 6:30 AM to ready the kids for school and get to work on time. They work all day with little personal time to take care of life's emergencies. Some people work until 6:00 PM, get home around 7:00 PM. Then, it's time for dinner and to spend the precious, few leftover minutes with the kids before bed. There's your day. It's 9:00 PM before the only me time most people have begins. I'm painting this picture because this is you, and this is your customer. You are both trying to do what you can to live a somewhat balanced life. Most of us don't have time in our lives for things to break. When we choose to do business with the company, we need those products and services to function a hundred percent of the time, so we can continue to sustain our lives. If you can be a company that is different because you have compassion and you think about your customer's lives outside your doors, you will attract a greater following. We know that today, most companies don't think about the reality of customer's lives. If they were compassionate toward the plight of their customers, they would create experiences for customers that made their lives easier, not harder. If more employees within companies thought about what they were taking away from customers by not being customer centric, they would change the way they worked. They wouldn't treat customers like numbers on spreadsheets. Dan: I love this idea of stepping into your customer's shoes and really trying to understand how your company plays a role in their day-to-day lives, and oftentimes, as Blake points out, your customer's day-to-day lives are, might be very similar to your day-to-day life, and so it's something that you can relate to. In other cases, you might work for an organization that you're not a customer of, or that the customers have very different lives than you're used to. In that case, it may be more difficult for you to put yourself in their shoes, but no less important. Joey: Absolutely. I mean, if this is kind of a customer experience 101, you have to see it from the customer's perspective, and yet again, despite the fact that we know this, so few companies are doing this. I'm a big believer in creating the opportunity for every employee you have to experience the brand and the way your customers would experience. I think we've talked about in previous episodes, and I was just having this conversation with a colleague who is very heavily involved in the restaurant industry. He's run a bunch of restaurants, grown a bunch of big, well-known, popular national restaurants, and I was lamenting the fact that how often the people who are working at a restaurant have not sampled the food that the restaurant offers, and it drives me bonkers. I'm like I want to be able to say to a waiter or a waitress in a town, in a restaurant that I've never been to, in a town I've never been to, "Hey, what's the best thing here, or what do you like the best, or what's the chef best at? ", and I like them to have that answered based on their own personal dining experience as opposed to what they heard, and the perfect example of how you did this is you get your employees to step into the customer's shoes and see what it's like to place an order. Dan, what was your favorite passage from the book? Dan: My favorite passage was that "Effort is among the most important aspects of customer experience". Blake says, I've said it before and I'll say it again, "Make your processes harder on you, the business, and easier on your customers." That means serving your customers in the way they would like to be served, and she repeats this a couple of times. I think it's really interesting because I haven't heard it stated in quite this way that if the process is going to be difficult or confusing, it should be difficult for the company, not for the customer. I like that because we talk a lot about making processes easy for the customer, but sometimes, the backend is really complicated, and you can't help that, but if you're able to keep that behind the curtain and basically have your own employees deal with that or your company deal with the complexity, but still make it easy on the customer, that is a great way to reduce the effort, and therefore improve the customer experience. Mr. Coleman, what was your favorite passage? Joey: I really like this one, and I'm quoting, "If an individual isn't happy at work, he's probably not going to smile at the customer. We're all human. We all understand what it feels like to have a bad day, but when all the company's employees appeared to be having bad days all the time, one has got to wonder, 'What's going on in the company?' Happy employees have more energy for customers. They smile easily or sociable, and are more prone to be empathetic to the customer." I love this passage because it's something as simple as the smile. Right? If your employees are not enjoying their jobs, if they're unhappy, if they're frustrated, if they're having a miserable general state, if you don't think that's going to rub off on the interactions with your customers, you haven't been paying attention, and so that's why I believe that it's really important that the employee experience be a major part of what you're working on when you're trying to create a remarkable customer experience. Dan: Totally agree. Check out 'More Is More' by Blake Morgan on Amazon. We of course include a link in the show notes at ExperienceThisShow.com. I also recommend following Blake on Twitter. She is @BlakeMichelleM, and she's a good follow. She creates a lot of content. She writes a column for Forbes, and is always putting out good content around customer experience, so a really good follow on Twitter as well. Thank you, Blake for sharing with us your overview and your favorite passage, and check out 'More Is More'. Joey: We love telling stories and sharing key insights you can implement or [avoid 00:12:46] based on our experiences. Can you believe that this just happened? Dan: Joey, I'm really excited about this segment because it comes to us from one of our listeners. Joey: Woo-hoo, listeners, calling in using the SpeakPipe, leaving us messages. Joey: More of you should be doing this. Come on, people. We listen to these. You might get to be on the show. Let's do it. Dan: This is from Denise Treco, who is the Director of Communications and Marketing at the Jacob Burns Film Center in Pleasantville, New York. Now, the Jacob Burns Film Center is a nonprofit, five-screen cinema and education center. It is one of the most successful suburban art houses in the country. According to their website, which is BurnsFilmCenter.org, they celebrate film as a vehicle for entertainment, education and inspiration. Now, we asked Denise to record a short snippet on a unique experience that they have created for their customers. Let's take a listen. Denise Treco: Hi, my name is Denise Treco. I'm the Marketing Director at the Jacob Burns Film Center, a nonprofit art house theater in Pleasantville, New York with a robust membership program and film community. Over the years, our creative and fun staff has organized holiday potlucks and cook offs with prizes. Some of my colleagues have bragging rights with three or four prizes they show off on their desks. We decided to collect some of our favorite recipes, and even some prize winners from our cook offs as a thank you to our members. We created a PDF cookbook to share. The idea being, recipes from our family to yours. We're always looking for new ways to go the extra mile as a thank you for our supporters and demonstrate our appreciation. We also like to highlight the community aspect of our center. We emailed our members with a special holiday message and included a link to the PDF cookbook. We received many emails from members thanking us for sharing the recipes. For example, Linda and Bob wrote us to say, "I just want to say thank you for this very lovely cookbook. What a great idea, and how kind of you to share it with all your Burns fans. The Burns Film Center is one of the blessings my husband and I are most grateful for here in Westchester, so thank you." Suzie emailed in and said, "Thank you very much. What a great idea and very thoughtful present. I can't wait to try some of the recipes." We shared the emails with our staff, and it was so nice to see that our efforts were appreciated. Joey: Denise also shared with us the email that she sent to their supporters, and here's what it said. "We wanted to take a moment to thank you for being a part of the JBFC community. Your commitment to the Burns helps us keep the movies playing, the popcorn popping, and the students of all ages learning and making all kinds of exciting new media. As a token of our appreciation, we want to share with you the Jacob Burns Film Center family cookbook, a collection of our staff members' favorite recipes that we've enjoyed across countless JBFC potlucks and cook offs. We hope you'll enjoy them this holiday season as much as we do. Best withes, the JBFC staff." Dan: I think this is such a great idea because it is very personalized, it is from the heart, these are recipes that come from the employees of the film center, and it's a really nice gesture for their customers or their patrons, and the best part about it, it was basically free. I mean, they put together a PDF, so it took somebody's time, but it really didn't cost a lot of money, and yet, as you can tell from the letters that Denise read to us, it really made an impact on their supporters, so I think it was tremendous. Joey: Totally agree. You know what's interesting, and when you look at the cookbook, it feels friendly. Right? It feels like it was made by your next door neighbor or the person down the street, and I think that's so on point with the Jacob Burns Film Center family and what they do, and kind of the ethic and the ethos I think of what they're trying to create, and you can hear about it in the way Denise describes, how they came up with the idea, and it really translates to what they give. I think this is also another great example of the moments of surprise and the little extra gifts and presents and perks that you give your customers. They don't have to be directly related to what you do. It's not that they sent them a VHS tape or a DVD, and said, "Oh, here's a film that you might have seen at the film center, and here you go." This is something one would argue kind of tangential to what they do around food, but yet, the reality is it's not tangential at all because it's about community and having a shared experience. Dan: Absolutely, and I have some great news for our listeners. As listeners of the Experience This! Show, you too can have access to the Jacob Burns Film Center cookbook. Yup, we have got the link in the show notes to the PDF, so go to www.ExperienceThisShow.com, and in the show notes, you will see a link to this fabulous cookbook. Joey: Go check it out seriously. There are some things that Dan and I were talking about before we recorded the podcast, and I think Dan is going to make me the Potato Gnocchi. I'm really excited about that, and thanks, Denise so much for sharing with us. We greatly appreciate when listeners call in, so go to the website, ExperienceThisShow.com. There's a little button there for SpeakPipe, our little, funky widget that allows you to leave us a recording, and tell us about an amazing experience you've had, something that you do for your customers that you think is unique or different or that they seem to really love, a moment, something that you love about customer experience, something that you can't stand about customer experience. Go ahead and leave us some messages. We want the podcast to be an experience for our listeners as well, and we'd love to have you participate, so check it out, and who knows? Maybe we'll feature you on a future episode of Experience This!. We'd love telling stories and sharing key insights you can implement or [avoid 00:18:55] based on our experiences. Can you believe that this just happened? Dan: Before we begin this next segment, I do want to tell our listeners you did hear correctly, this is a second 'This Just Happened' segment. We've never done that before, but we are all about creating new experiences each and every time, so we're going to try two in a row and see what happens. Joey: We're breaking the rules here, folks, but Dan insisted he had had this experience that he wanted to talk about, and then we were like, "All right. Let's have another This Just Happened." Dan: All right. I was in New York City recently at a Customer Service Conference, and I wanted to bring my microphone along because I wanted to record some people at the conference giving us some inputs into love it and can't stand it, because a lot of our listeners are attending such conferences, and I forgot my microphone, and I was like, "Oh man", and I thought about just recording it on the iPhone, but I just want it to be a little bit better and make sure that the quality was there. Dan: I'm in Manhattan, and I'm like, "Hey, I got this electronic stores on pretty much every corner. Let me just go find one", and so I go walking and walking and walking, and it's like blocks and blocks, and finally I'm near Times Square, and I find this electronic store. I walk in, and they're selling all sorts of stuff, and plus, they've got all these New York gifts and mugs and Statues of Liberty and stuff like that, and so I go to the counter and asked this guy if they have any microphones, and so he brings me over to this section, and they have two choices, and one of them is a Sony microphone, and the price tag says $129.99. I'm like, "Holy cow. I am not that desperate for a microphone. I think I'll just use the iPhone." "Thank you so much. See you later." As I'm walking out, the guy says, "Hold on a second. Hold on. For you, 39.99." I'm like, "I'm sorry. What?" Joey: Wait. Wait. He cut the price that much on the opening valley? Dan: Yes. He goes from 129.99. The sticker is on the package to 39.99. At that point, I turned around, and he's got my attention. I'm thinking to myself, "It's still more than I wanted to spend", but I'm like, "I mean, I need the microphone. I'm in New York." Joey: [Wrecky 00:21:45] move. [Wrecky 00:21:46] move. Dan: No. I knew what was happening, but I was like, "If I look this up, it's going to change the whole story, and so whatever. I'm not going to." Joey: Just for our audience listening at home, at this point, Dan is thinking, "No matter how this story ends up, it's ending up in the segment on the podcast", so this is where there's the recognition of, "I may be about to be taken to the cleaners on this deal, but you know what, it'll make a very good story." Joey: It's part of the reason we get along. I think the same way. Dan: Exactly. I buy it for $40, plus tax. I bring it back to my hotel room, and as I'm about to open it, I'm like, "Now is the time. I'm going to open up Amazon, scan the UPC, and see what I just got myself into." Would you like to guess what the price was on Amazon? Joey: It's going to be bad. It's going to be bad. 20 bucks? Dan: It is also at this moment that I stare at the receipt, which says, and I quote, "Absolutely no refunds. All sales and layaways are final. No exceptions." Dan: I'm like, "Wow. Was this a fantastic experience", and so first of all, before we get to the takeaways, I just want to tell you if you're ever walking around Times Square and you're like on, I don't know, 8th Avenue, between 42nd and 43rd and you happen to need any electronics or New York City collectibles, I suggest that you keep walking. Joey: Keep walking, people. This is ridiculous. I'm sorry. This is not a way to run a business, even if you think you have the monopoly on a product or a service, or you're offering something in an environment where it's difficult for them to find that product nearby. Don't gouge your customers. Just don't, and I get it. Every business has the right to do a markup, but if this is 9.99 on Amazon, that means that if this person that ran the electronic store in New York is buying through a wholesaler, they bought it for even cheaper than that, and I guarantee there are plenty of people who have come into that store and purchased it at the $129 price tag that it originally was, so yeah. Don't do this, people. It's bad karma, and it leads to bad word of mouth than people telling the story about how not to shop at this store around their podcast. Not a good thing. Dan: Absolutely, and obviously, I've learned my lesson. The next time, I will just record using the iPhone, but so I have three takeaways here, and you mentioned one of them. The first is ripping off your customers is not a sustainable business model. I mean, even the $40 price, which is four times the retail cost on Amazon is way overpriced, but $130, I mean, I hope that no sucker actually ever paid that, but I think you're right. They probably have sold multiple of them at $130. Joey: The funny thing, and forgive me for interrupting, Dan, what you just said though if you listened, "Had I seen that on the receipt before I purchased." Joey: Right? I don't mean to be critical of you, but I guarantee that's by design. That's not clearly posted somewhere in the store. It's, "We'll tell you afterwards", and the lawyer in me or the recovering lawyer in me is just like, "Come on, you can't do that. You can't make people agree to something after the purchase. That's ridiculous." Dan: Exactly. The third one is pretty straightforward. If you treat your customers with respect, they will respect you back, and we talked about this many times on the show, but this was an opportunity for this guy to create an advocate for his business, for me to tell other people that, "Hey, when I really needed something, this was the place I went to, and frankly, the next time I'm in New York if I really needed something, I would go back", but instead, he's done the opposite and he has taken advantage of what he thinks, "He's a tourist that may never be back", but it turns out A, I'm in New York quite often, and B, I am the co-host of a podcast. I'm now telling everyone I know not to go to this store on 8th Avenue between 42nd and 43rd. Joey: Yeah, and the crazy thing is he was right. You were a tourist, and he's right. You will never go back. 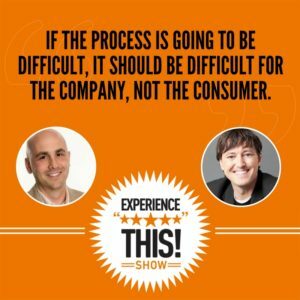 Listen in while we try to stomp and surprise each other with a fantastic statistic from the worlds of customer experience and customer service. It's time to check out this number. Dan: This week's number is 80%. What do you think it means, Joey? Joey: I'm going to go with the percentage chance that you're about to drop another baseball reference in this segment. Dan: Yeah. I know you've got me on that before, but no. This time, I'm not going because it actually refers to the percentage of customers who rely on word of mouth from peers on where to shop. Kind of ironic given our last segment about a certain electronics retailer in New York City, isn't it? Dan: This statistic comes to us from the 5-9 customer service index. A summary of which is found at SmarterCX.com/Experience-this. Joey: What I think is fascinating about this stat is it makes perfect sense if you think logically about it, when we need something new, when we need a new product, when we need a new service. Invariably, we ask our friends, "Hey, who do you go to for your dentist? Where did you get your lawn mower?" Whatever it may be, we check with other people we know because that word of mouth is really valuable, and yet, so few companies are taking this into consideration. If you create the remarkable experience, you dramatically increase the word of mouth. It's that simple. We don't have to make this anymore difficult than that, I promise you. 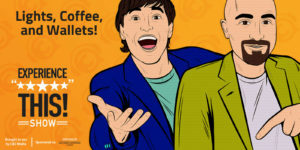 Dan: No, that you are checking it out, and what you'll find there is Smarter CX by Oracle, a brand new destination for professionals who are building the next generation of customer experience. You'll find breaking CX news, in depth analysis, and useful tools that will empower you to create remarkable experiences for your customers, so check it out today at SmarterCX.com/Experience-this.